Months ago the PeaceGeeks team began to dream of what welcoming refugees and newcomers to Canada could look like if it was supported by the right technology. Like true geeks, we transformed this dream into a blueprint, a project plan, and a new challenge - to be one of roughly nine hundred NGOs in Canada to capture Google’s attention and gain its support in turning our project into a reality. 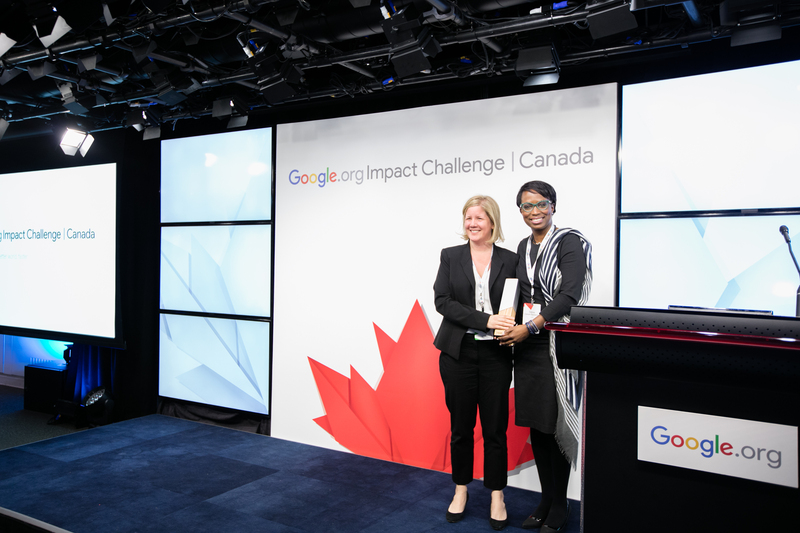 We entered the Google.org Impact Challenge in Canada (GIC), a competition aimed at supporting Canadian non-profit innovators using technology to tackle the world's biggest social challenges and showcased our big idea – an app aimed at welcoming new Canadians to our shores, making it easier for newcomers to access their most relevant and timely settlement services like mentorship and language training. We stood alongside great leaders in Canada’s not-for-profit sector looking to pitch their own innovative projects and were amazed by the creativity and drive of these organizations. Fast-forward to today and we are proudly one of five organizations to be awarded the top GIC prize of $750, 000 to bring our idea to life, with an additional five organizations receiving $250,000. "PeaceGeeks is poised to make a pioneering contribution to the way that immigrants and refugees access information about services in Metro Vancouver." This funding will go a long way in helping our team develop and launch our Pathways app project in Metro Vancouver, and eventually, the whole of Canada. In a brief interview with CBC News our founder and CEO, Renee Black, highlighted how much of a “game-changer” winning this award is in advancing PeaceGeeks’ work helping refugees and immigrants of all backgrounds navigate a new life in Canada. Renee also voiced just how excited our team is to begin “working with current and new Canadians to make our country stronger and an example” when it comes to connecting newcomers to relevant services, mentors and resources. This feedback and the widespread coverage of our journey to winning the GIC competition in Canadian media (see Global News, the Vancouver Observer and the Daily Hive) has given us even more motivation to continue pushing the boundaries of technology and innovation to deliver tools that protect and promote human rights and peace around the world. Our vision for the Pathways app project comes from the desire to solve a simple problem. The phase of ‘arrival’ marks an exciting yet challenging chapter in the journeys of newcomers to Canada. While there are innumerable services and vast amounts of information designed to help refugees and immigrants transition into their new lives, many of these resources remain difficult to navigate and access. Pathways aims to help newcomers build personalized settlement roadmaps and connect directly to key information and services in Metro Vancouver, such as language classes, housing and employment services, that are most relevant to them based on their circumstances. Pathways is a two-year project that will be launched first in Metro Vancouver with the longer-term vision of making the app available across the province of British Columbia, and eventually across Canada. The app builds on our prototype, Services Advisor, which was developed in collaboration with the United Nations High Commissioner for Refugees to provide refugees in conflict zones with a more complete and up-to-date directory of essential humanitarian services available to them. Launched by the UN’s refugee agency in October last year, Services Advisor is currently being used in Jordan and Turkey. While there is much work remaining to be done on developing Pathways into a tool that millions of newcomers across Canada can use to better navigate their arrival, the GIC award provides our team with a great start in turning what was once a dream into a reality.